By 2017 Barbara Shinn and her husband, David Page, had worked very hard for twenty years to create a natural ecosystem in their vineyard. In order to achieve this they committed themselves to growing grapes that they hoped would be organically certified by the USDA, as well as being fully certified by Demeter as a Biodynamic vineyard. It didn’t work out, at least not exactly. More about that below. They did, however, become leaders in the sustainable farming movement in Long Island, so what happened in April 2017 was a complete surprise to the wine community. Interestingly, it was a surprise to Barbara and David as well. They received an unanticipated, solid offer to purchase Shinn Estate, including the winery, vineyard, inn, and windmill, that they could not refuse. The property was sold to Barbara and Randy Frankel, who live in the Hamptons. When Barbara and David bought their property on the North Fork in 1998, they knew nothing about grape-growing or wine-making. At the time, they already owned a successful restaurant, Home, in New York City, but they were drawn to the North Fork by its excellent produce and seafood, as well as the rural charm and unspoiled villages. Already committed to the idea of using local produce served with local wines, a philosophy that was embedded in the cuisine and wine offerings of their restaurant, the wineries of the area also beckoned, and they finally bought a twenty-two acre plot of what was once a wheat field. They became friends with many vintners, including Joe Macari, Jr., who showed them how to develop a vineyard according to sustainable practices. At first they only grew grapes for sale to other wineries, but by 2006 had one of their own. In 2007 David and Barbara opened their converted farmhouse into a B&B so that they could continue to pursue their devotion to the locavore movement along with their own wines. They moved from conventional farming to an increasingly organic and then Biodynamic approach slowly and carefully beginning in 2002, then started the transition to organic viticulture in 2005, and to Biodynamic practices by 2008. Unfortunately, they never got there. The greatest problem facing Shinn Estate—as well as all vineyards in Long Island (and for that matter, all of the East Coast)—is the hot and humid climate, which helps promote all manner of diseases of the vine, including powdery and downy mildew, black rot, and phomopsis viticola, or dead-arm. To control these pests, conventional farmers use a host of industrial pesticides with great success—it is this that has made vinifera grape-growing possible in regions where it would otherwise wither and die. However, there are new weapons for the organic and Biodynamic growers, such as Regalia (according to the manufacturer, “a patented formulation of an extract from the giant knotweed plant (Reynoutria sachalinensis). Its unique mode of action switches on the plant’s natural defense mechanisms to inhibit the development of bacterial spot, bacterial speck, target spot, powdery mildew, [etc].”). Shinn also uses Serenade (which according to its producer, “consistently helps growers win the battle against fungal and bacterial diseases, as it contains a unique, patented strain of Bacillus subtilis . . . to destroy diseases such as Fire Blight, Botrytis, Sour Rot, Rust, Sclerotinia, Powdery Mildew, [etc].”). Nevertheless, as Barbara Shinn admits, the Achilles Heel for any organic or Biodynamic viticulturalist is downy mildew. By far the most effective control of this blight is copper sulfate, which is an industrial product that is almost unique in being accepted for both USDA Organic as well as Biodynamic farming. While there are usually few limits as to how much copper sulfate can be applied in the course of a growing season, anyone using it is aware that the copper content is inimical to healthy soil. While it may destroy downy mildew, it is also highly toxic to organisms in the soil, and in sufficient quantities it will drive out beneficial ones such as earthworms. Worse, it is a strong irritant to workers and also has long persistence in the soil, to which it bonds strongly, so it accumulates over time. However, Biodynamic farming does allow up to three pounds of copper sulfate per acre to be added in the course of a year. For many farmers, this would not be enough, and double that application would not be unusual, especially in this region. Still, Shinn tried to abide by this strict limit. Like all Long Island viticulturalists, the Estate uses Vertical Shoot Positioning (VSP) for training their vines. The vines are planted to a 7’×4’ European-type density, which helps to lower yields and leads to more intense wine. Then, shortly after budbreak they select the shoots that each vine will grow to provide canopy, removing the rest. Once the vines bear fruit, they go through each one again, removing about two-thirds of the berries so that the remainder will benefit better from the resultant increased nourishment they receive from the vine. This means that the wines made from this fruit will have more intense flavor and aroma without having to resort to very much intervention in the winery. One approaches the winery from a narrow country road distinguished only by the sign for the estate and the attractive farmhouse by the entrance. A tall windmill, newly installed to generate electricity for the winery spins its blades in the wind and stands as a testament to Barbara and David’s commitment to self-sufficiency and sustainability. Carefully-tended rows of vines have been planted nearly to the edge of the road. Barbara and David were in the parking area with Anthony Nappa, their winemaker back in 2010, when I arrived. (Anthony is now winemaker at Raphael and Patrick Caserta has taken his place.) Shortly, we went to the warehouse where they age their wines in oak barrels. 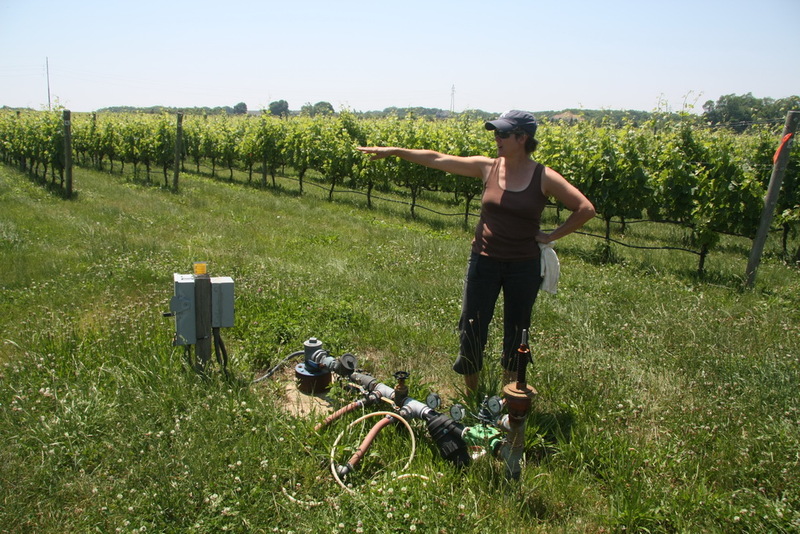 The vineyard tour brought us first to the irrigation system, which is an electrically-controlled mechanism that Shinn uses primarily for its Biodynamic compost tea inoculation, which is administered once a month. The tea is made by taking the Biodynamic preparation that has been aged in cow horns buried in the ground, then mixed with water into a 50-gallon batch that is fed into the twenty-two acre vineyard over a period of an hour. This is but one of several means by which Shinn provides the necessary, natural nutrients to keep the soil healthy. Other organic soil amendments include limestone, potassium, humic acid, kelp, and fish hydrolizate (liquefied fish, which is rich in nitrogen). As a vineyard is a monoculture crop, vegetal diversity is attained by planting various kinds of cover crops between the rows of vines. 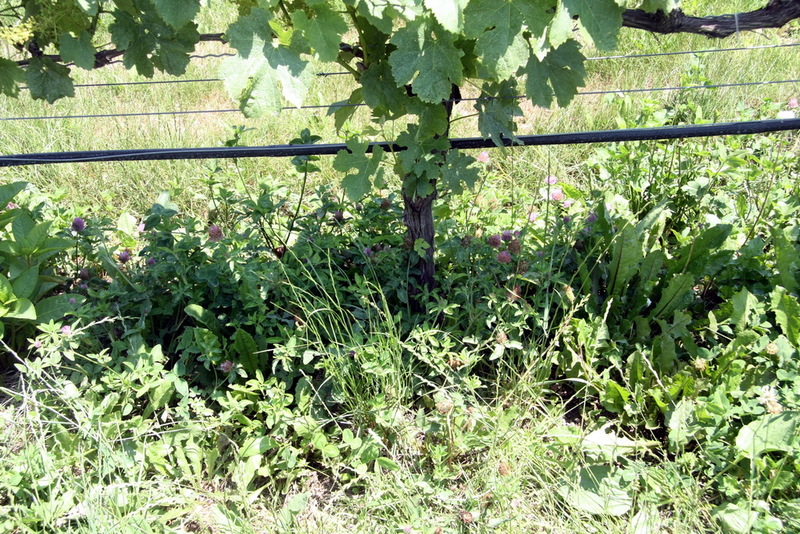 Thus there are different kinds of grass, clover, and perennials and annuals that grow throughout the vineyard. This cover crop provides habitat for all manner of insect life, enhances the organic mix of the soil, and is a healthy environment for the microorganisms of the soil. In addition to its diversity, the cover crop also helps reduce the vigor of the vines by forcing them to compete for water with other vegetation when it’s rainy (a good thing when one is growing wine grapes) and at the same time helps the soil retain moisture better when it’s dry. Like any vineyard that is farmed according to sustainable practices, Shinn Estate employs Integrated Pest Management to deal with insect pests (which means using natural predators to help control them). They also have sought to encourage insectivore bats to live in special habitats built for them in the vineyard—so far, however, the bat houses have no takers. They planted different clones of each grape variety, with six selections of Merlot, for example, and three each of Cabernet Franc, Cabernet Sauvignon, Malbec, and Petit Verdot. There are also two selections of Sauvignon Blanc and Semillon that account for the white varieties. Each block of grapes is hand-harvested separately, with the east and west sides of each row of vines being picked separately as well. In addition, they also lease a small, five-acre plot, Schreiber Vineyards, which is planted with 30-year-old vines of Chardonnay and Riesling, which adds more variety to their portfolio of wines. It lies just a mile up Oregon Road and is farmed identically to the Shinn vineyards. 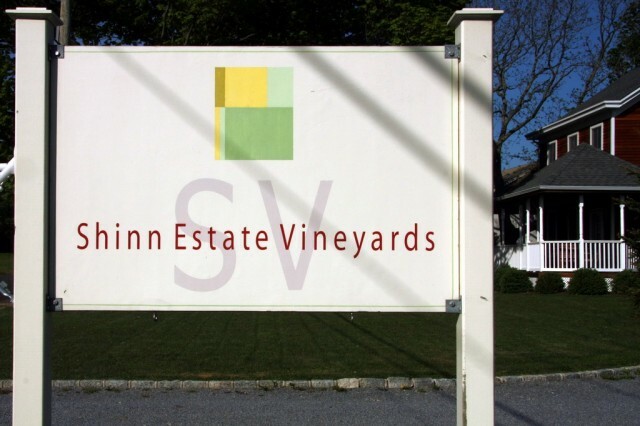 By 2012 Shinn Estate was one of the founding Vineyards to join the Long Island Sustainable Winegrowers certification program (for more about it see the post, LISW). That was the easy part, as it were, since they were already following all the practices set forth in the LISW workbook. The hard part, organic certification, still eluded them in 2017 as downy mildew, in this humid climate, still cannot be tamed by strict adherence to organic grower’s guidelines. And now they have sold Shinn Estate to a New Jersey financier and his wife, Barbara and Randy Frankel: Shinn Estate Announcement of Sale. Newsday wrote that the sale had “not been part of the plan,” but an unexpected offer changed that. “It came as a surprise to us someone would walk through the door and make us an offer,” he said. He declined to discuss terms of the sale or the new owners. Randy Frankel is a former managing director at Goldman Sachs, whose various business interests include a minority stake in the Tampa Bay Rays baseball franchise and part-ownership of Windham Mountain Ski Resort in Windham, N.Y., according to an online biography. 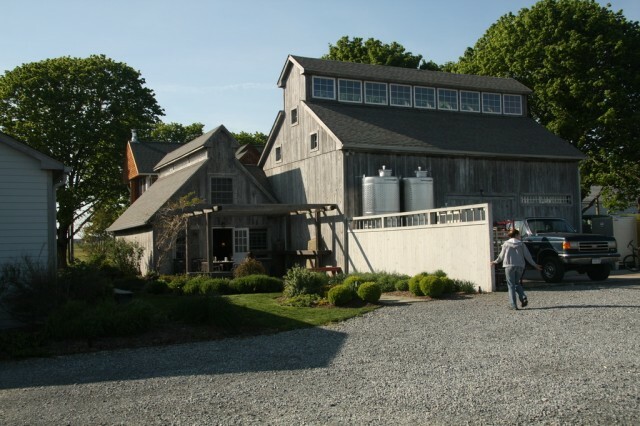 The Frankels wanted to take a new path in business, and as residents of the Hamptons were well familiar with the wineries of the East End of the Island. They hired Robert Rudko as an advisor. Rudko, who has been in the wine trade for many years, helped find the property, which fit their hopes and expectations exactly. Rudko is now running the property as both CEO and General Manager; he is working with the new owners, assessing the vineyard, the winery and tasting room, and the B&B. Already, according to him, an expanded tasting room with a real “Wow” design is in the works. The winery is due for some significant equipment upgrades and the B&B is being refurbished. He said that once all the work is completed, it will leave visitors “slack-jawed” by the transformation. Patrick Certa, who has worked with the Shinns as winemaker for several years now, will continue in that role. The vineyard and the sustainable practices used to work it shall continue as well. However, the new owners are hoping to acquire new vineyard parcels to add to the current acreage in order to expand production. The sale represents the closing of a distinguished and dramatic chapter in the story of the wineries of Long Island and the opening of a new one. Based on interviews with David Page and Barbara Shinn, 18 June 2010, with additions from their Website, and on 23 May 2014. The interview with Robert Rudko was on 24 April 2017. This entry was posted in Tasting rooms, Vineyards, Viticulture, Wineries and tagged Barbara Shinn, Biodynamic Viticulture, David Page, Long Island Sustainable Winegrowers, Long Island Vineyards, North Fork Wineries, Organic Grapes, Organic Viticulture, Randy Frankel, Robert Rudko, Shinn Estate Vineyards, Sustainable Viticulture, Vineyard terroir on 22 May 2017 by JoseM-L.